Right beneath the Montjuïc mountain lies the Poble Espanyol. This “Spanish Village” was built for the 1929 World Exhibition in Barcelona. We didn’t really know what to expect of the „Spanish Village“. The only thing we did know was that this artificial village was designed for the 20th World Exhibition 1929 in Barcelona. On 200 hectares on the northern slope of the Montjuïc mountain, a complex was laid out that consisted of three separate exhibition areas. The main entrance faced the Plaça d’Espanya. The lower level was home to the traffic and transportation palace, the electric- and textile industry buildings, the Spanish Welfare pavilion and the fire station. The country pavilions, the modern art palace, the royal pavilion and the Palau Nacional followed. The stadium was located on the highest part of the area. In addition, many gardens and quiet paths were built. Even today some of the buildings that were constructed for the 1929 World Exhibition can still be seen here. 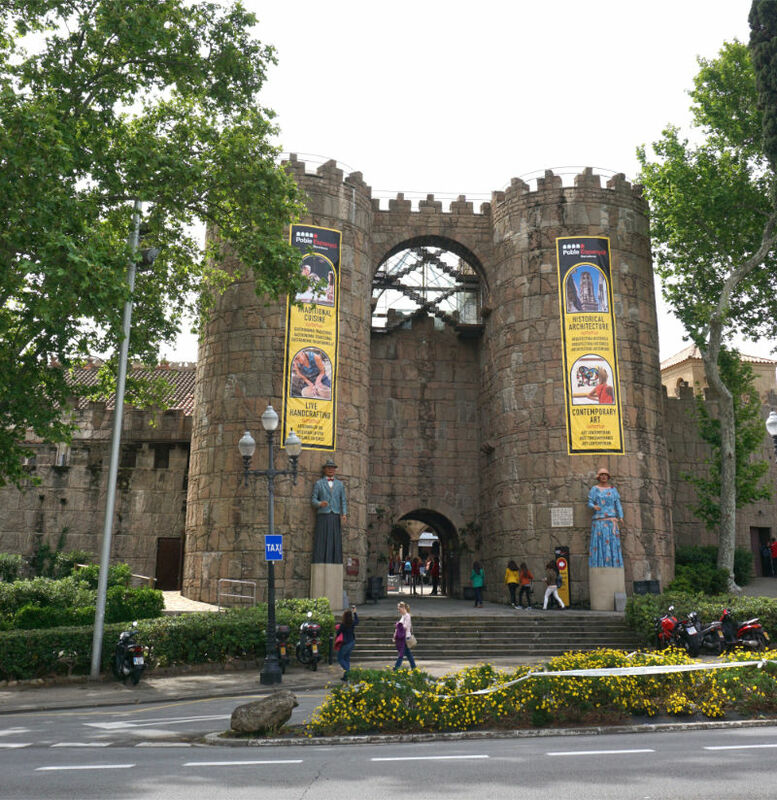 The Poble Espanyol is the most well-known of them and many guidebooks keep pointing out that it was built for the World Exhibition. But also the Palau Nacional (National Palace), the Estadi stadium, the Torres Venecianes and a reconstruction of the German Mies Van de Rohe Pavilion are part of the cityscape of today’s Barcelona. In 1929 it was common practice to give visitors to the World Exhibition a general idea of the host country by erecting replicas of characteristical buildings. After stepping through the reconstruction of the San Vincente of Ávila city gates visitors find themselves in a small town composed of the most beautiful buildings of the country. Right behind Las Arcadas is the Placa Major, a big square. And when slowly turning around, the free map of the exhibition grounds in hand, one recognises many different Spanish buildings. I liked strolling through the many small alleyways. Some of the houses are small craft shops that sell pretty goods at reasonable prices. In one of the workshops, I picked up a lovely handmade bangle and in a glass blowing workshop we observed the creation of a glass animal that only took minutes. A closer look reveals the diversity of architectural styles of the houses, squares and alleys. 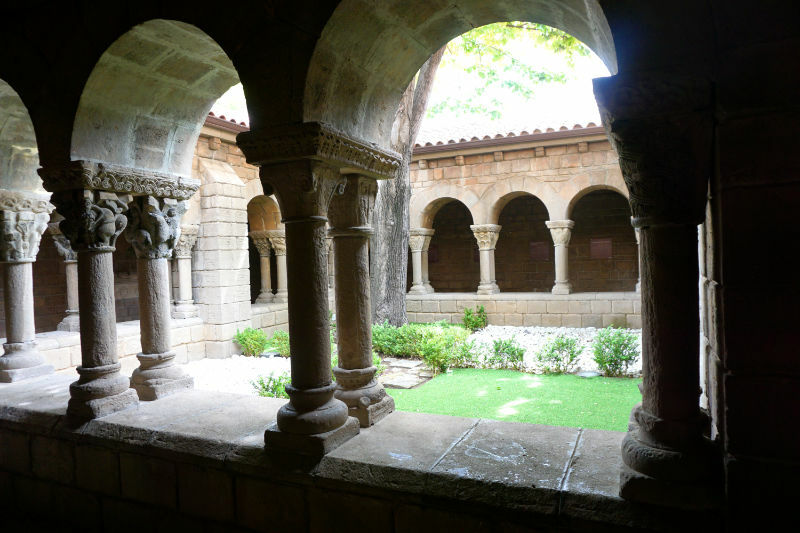 I liked the replica of the Monestir Romanic de Sant Miquel quite a bit. It is a little out of the way and only a small number of visitors come to see it but don’t neglect the tiny museum with works by Picasso, Dalí and Miro, amongst others. There is no additional admission fee for the museum and it has some fascinating pictures on display. I liked this excursion. 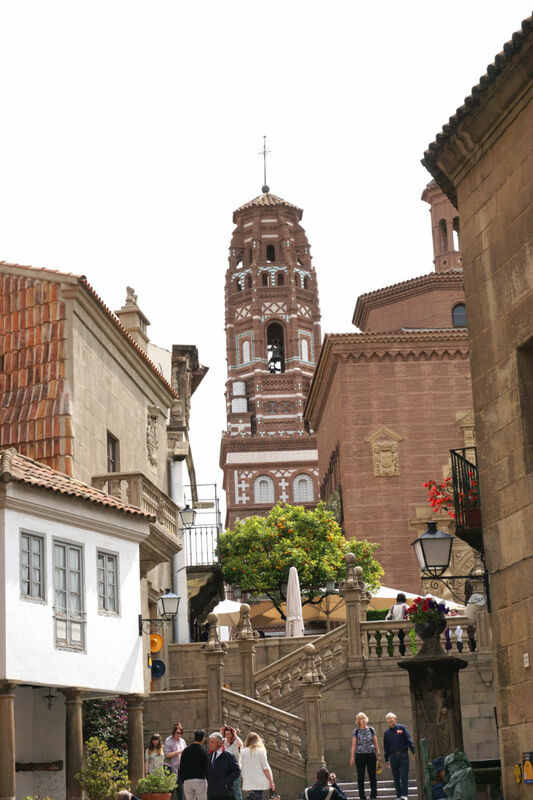 It gave me an impression of Spain and its buildings, just as the creators wanted it to.